If you own an iPhone or have ever received an email from someone with an iPhone, then I am sure you are familiar with these four words. 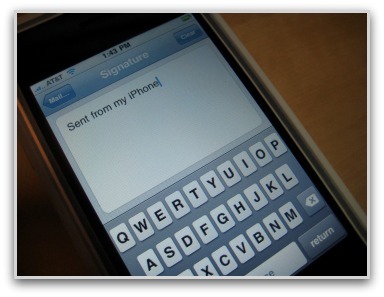 For those that are less familiar, “Sent from my iPhone” is the default email signature on the iPhone. So, are Apple users just that proud to have the best mobile phone known to man (unbiased opinion) and enjoy rubbing it in everyone’s face, or did Apple actually apply some logic to this? Regardless, when I first bought my iPhone, I immediately changed my signature to match my work signature. I wanted my email to appear no different than it would if I sent it from my desk, so you couldn’t tell that I was actually responding to an email during my longer than normal lunch break. The last thing I wanted was my boss to know that I wasn’t at my desk during certain times of the day. Unfortunately, this maneuver failed to distinguish when I was emailing a client while I was on the run. They had no clue that I was responding to an email during dinner with my family. Now that's dedication. Although both of these may be valid concerns when creating a mobile email signature, they should be the least of your worries. Anyone who has sent an email from a mobile device, and who is above the age of 17, knows how difficult it is to write more than a few sentences. So instead of writing a fast but sloppy response or painstakingly constructing a finely-tuned e-mail on your tiny mobile phone keyboard, I suggest you simply let people know right away you'll get back to them later. When I can, I like to respond with, "I'm away from my desk. I'll email you when I return." Here's another trick: When you absolutely must get back to someone immediately via a mobile device, go ahead and put in a word or two apologizing for any errors that may come up. You can even make this part of your signature. After all, typing without errors is extremely difficult on a touch screen. Have any of the above concerns every come to mind when you see that all too familiar iPhone signature? What do you sign your mobile emails with? Share with us in the comments below or on Twitter.